Welcome to my garlic benefits tips guide. Here you will learn why is garlic good for your health and how you can include it into your regular diet, without suffering from its strong and for many people unpleasant taste and scent. Besides its health benefits there are few more of a different kind, quite forgotten in these modern days. When you learn about them, I’m sure you’ll think twice before skipping garlic when making your next grocery list. 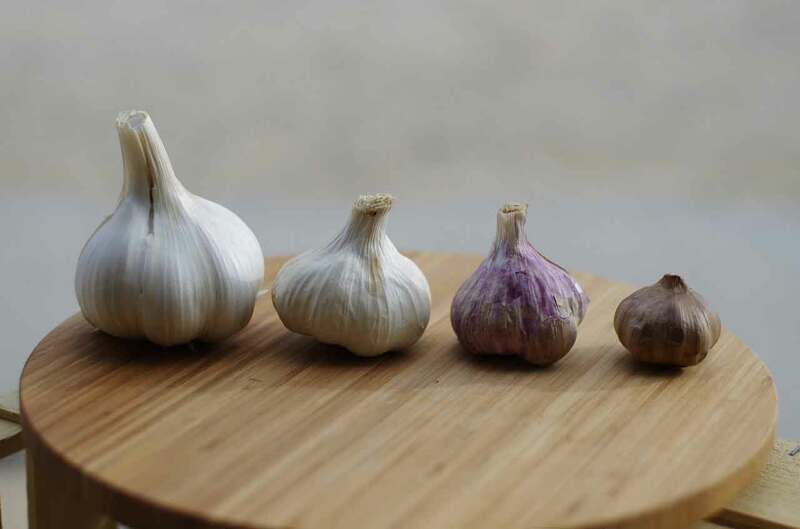 By lowering the level of triglycerides in your blood, garlic indirectly lowers the level of bad cholesterol (LDL) and increases the level of good cholesterol (HDL). By preventing the bad cholesterol from accumulating in blood vessels, garlic helps in avoiding serious cardiovascular conditions such as angina (chest pain caused by lack of oxygen in the heart), atherosclerosis (condition in which there already is a cholesterol lining in blood vessels) and the worst one – heart attack . Garlic is a powerful weapon against microbes, due to its anti-parasitic and anti-septic properties. It’s also often referred to as a natural antibiotic. For example, it’s the oldest trick in the book for treating diarrhea, as it effectively kills the virus that causes it and helps you get better much sooner than by being on some strict diets. Another good example is flue infection. Did you know that people who often consume garlic, rarely (or never) have flue? Active substance responsible for such efficiency is allicin – chemical compound found only in a raw garlic. In other words, allicin is destroyed by cooking. So, to benefit from allicin, slice or squeeze fresh garlic and ad it to salads, or simply sprinkle it over some meet or fish right before serving it. If you use garlic regularly and keep your both cholesterol’s levels under control, your blood pressure will benefit as well. In other words, the lower the fat level in your blood vessels, the lower the risk of high blood pressure. This is how garlic impacts your blood pressure indirectly, by managing your cholesterol first. At the same time, there’s a direct impact as well and it comes down to the very essence of garlic as a herb. You see, there’s this great substance called garlic sulphides which (by causing specific chemical reactions) relaxes blood vessels and therefore directly improve the blood circulation. How about that?! Warning: Garlic will hopefully become a part of the so called conventional medicine some day. Until it doesn’t however, it can not be the substitute for the medical therapy of chronic hypertension patients, but only a valuable assistant. I myself prefer garlic in a natural, raw way. I avoid the odor by eating it with other foods, mostly in salads. However, garlic tablets, oil or capsules are great as your daily garlic supplements. So, in respect of the possibility of a choice, here’s a little selection of such products for you to pick from. Mediterranean diet uses garlic benefits the best way, because it combines garlic with just the right ingredients, making the final dishes delicious and healthy. Garlic and Your Garden – If Great for Humans, Why not for Plants? As a strong natural repellent, garlic can be used in your garden as a very successful insecticide and fungicide. Organic gardeners have been using garlic to fight aphids for ages and today it’s not news anymore that garlic is great against ants, caterpillars, spider mites, white flies and snails. The oldest method of using garlic in helping your plants fight pest and parasites is so called companion planting. You simply plant garlic bulb near your roses for example, or any other flower or vegetable you’d like to protect. For the best results one must of course know the specifics of each plant i.e. be a good eco gardener. For instance, garlic helps potatoes, tomatoes and broccoli, but chamomile helps garlic (improve its taste). Besides planting garlic itself, you can use different kinds of garlic based products for taking a good care of your garden (or just a lawn for that matter). Note: Some herbs like parsley, peas and beans don’t like garlic and wouldn’t benefit from companion planting, so if you’re an amateur when it comes to organic gardening, I suggest you consult the expert or a proper literature. My sister had a beautiful big dog, a mongrel lot like Rottweiler. His name was Nero. He was bitten by a tick twice, in spite of his tick collar. First time his vet helped him, although the therapy was long. Second time Nero wasn’t that lucky. Today my sister wishes she knew about the trick with garlic back then. It’s rather simple: peel the garlic, mash it (of slice it thin) and ad it into the dog’s meal. Besides keeping ticks away from your dog, due to its anti-parasitic properties garlic will keep your dog’s digestion system healthy too. Note: As with other alternative medicine issues, this one is taken differently by vets, so you better check with your vet rather than doing anything on your own. Daily dosage of garlic for an adult dog varies from one clove of fresh garlic per 10 to 30 pounds of dog’s weight.